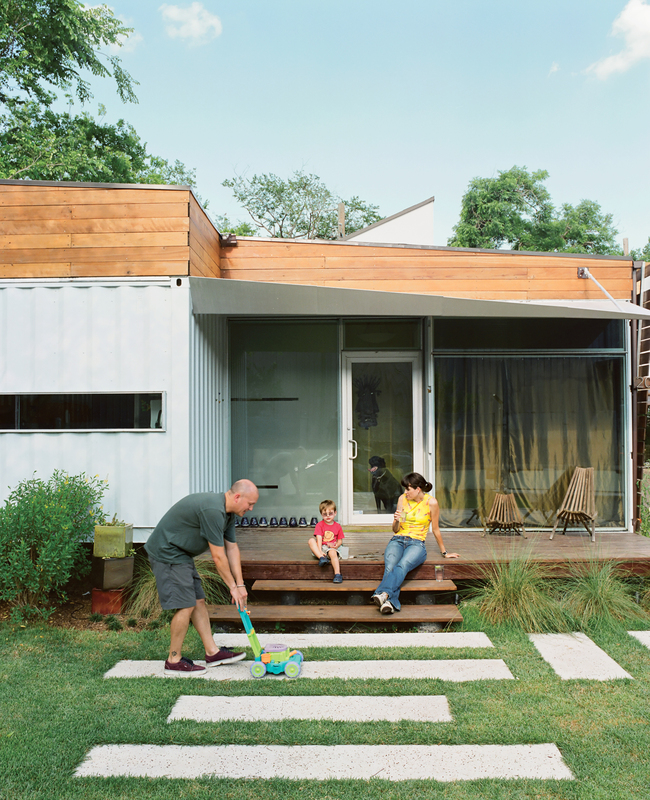 Shipping containers are ubiquitous in Houston, though unlike the four that make up this new home, they're usually filled with foreign goods rather than flourishing lives. One of the main draws of Kevin Freeman and Jen Feldmann’s house is its connection to the neighborhood, which is why the front porch was a must. “Homes that have a door but no outside space say, ‘I’m not interested in you,’” designer Christopher Robertson explains. “This says, ‘I’m here to be part of the community.’”Both Freeman and Feldmann's fathers flew down to help pour the cement steps in the front yard. For the lawn, the couple cover the yard with zoysia palisades instead of "the normal pokey St. Augustine grass" common in Houston. "We both come from the north where you can sit in the grass and be comfortable," Feldmann says. The bent-steel shade over the porch is held up with the help of an arm from one of the doors of the containers used to make the house. A door in the master bathroom connects the indoor shower to an outdoor one. Here, Feldmann and the couple's three-year-old son, Eli, wash their dog Arnold--named by the previous owner after the local St. Arnold Brewing Company. Robertson--with the help of developers Katie Nichols and John Walker, who were heavily involved in the design process--finished the guest bathroom with Modwalls tiles and a sink they found on eBay. They used a piece of marine plywood, leftover from building the front-porch steps, to create a counter on which the sink could sit--and where the family can rest their toothbrushes. To the right of the sink is a Toto dual-flush toilet, which is great for conserving water but has proven problematic for toilet training, as American potty seats aren't designed to fit these Japanese basins. In the cutout of the 40-foot-long container along the northern side of the house is the office and play area. It's a mix of new and old: The bookcase and desk are from Ikea's Expedit living room storage collection while the small table and chairs were made by Freeman's grandfather. "He was a furniture maker and would make one piece for each of the 13 grandkids each year," Feldmann says. The open-plan living spaces act like a “giant kitchen” that invites guests to mingle throughout the house. The white rug anchors the living room furniture, which includes two red couches from Room and Board and a coffee table and end tables that were thrift-store finds.Roberston opted for commercial storefront doors over sliding glass ones for the back of the house. "It's the least expensive way to get a wall of glass," he says. The only drawback: The doors automatically lock when they close so Freeman and Feldmann have to be sure to always have keys on hand. In the kitchen, Freeman fixes a snack while Eli plays on the counter, one of his favorite spots in the house, second only to the kitchen steps. The horizontal window, which acts as a backsplash, is at the perfect height for looking outside when seated at the bar (stools not shown). Robertson jokingly calls the home the "midrift house," as from outside, all you can see are the stomachs of whomever is working in or walking through the kitchen. Tucked away to the right at the end of the kitchen are the washer and dryer. Robertson originally was going to close off the area as a separate laundry room but later decided to keep the space open. The vertical window brings in additional natural light and has become the perfect access point for the compost bin, which sits outside below the window. To the right of the house, the couple had a Geosystems FilterPave porous pavement driveway installed. Made of post-consumer recycled glass, the driveway lets water pass through it at an astonishing speed and, in the sun, adds a little sparkle. Throughout the house, Robertson, Nichols, and Walker emphasized the beauty of the natural finishes and colors of the materials they chose. Robertson originally was going to paint the overhead beams but left them in their raw state to match the tiger bamboo that covers the floor. The light wall around the master bedroom, made from Enduro Systems fiberglass, is a light turquoise on the bedroom side, amber on the living room side, and glows green at night when the lights between the two layers are turned on. The wall outside Eli's room is covered with chalkboard paint, adding another method by which to leave messages around the magnetic house. The room measures in at just under 7.5 by 14 feet. "It was extremely necessary at some point to confront the constraints of the containers," Robertson says. The master bedroom is another place where Robertson placed emphasis on the existing size and shape of the containers. The room opens up to a clerestory window beyond the foot of the bed but the exposed edge of the container ceiling makes “you almost feel like a hobo on a train,” Feldmann says, romanticizing about her view from bed. The 400-square-foot deck between the main house and guest quarters catches a cool breeze—a big bonus during Houston’s “super-summers”—and is often filled with the couple and their friends enjoying local microbrews. "The challenge was how to stitch together the house and the guest container without it looking like at the last minute we decided we needed a little more space," Robertson says. Alongside the redwood shade screen, which keeps the house from overheating, Freeman and Feldmann grow vegetables in an 18-inch-wide garden. Despite their love for homemade meals made from homegrown food, they frequently bike to nearby eateries to enjoy the local Mexican cuisine. For the dining room, Freeman and Feldmann swapped their tiny table for Walker's larger one since he was moving into a smaller space. They topped their new table with a $12 pendant lamp from Ikea and finished the room with a console from West Elm. One challenge of using two 40-foot-long containers and one 20-foot-long unit in the main house was the different heights of the two container lengths. Rather than keeping the floor level the same, Robertson chose to lift the kitchen container up a few feet to match the ceiling height of the other two modules and add a step between the kitchen and dinning room. "Every home has its challenges," he says. "It's always like solving a Rubik's Cube." The guest quarters in the shipping container behind the main house is one of Freeman's favorite places. "We just haven't figured out how to use it yet," he says. When Eli was younger and woke up earlier, either Freeman or Feldman would take him back here to play without waking the other parent. Now, it is predominantly used by out-of-town visitors or the couple's parents when they come to stay. "The main house is such a social space that I worry about being misinterpreted as antisocial if I go to the guest quarters," Freeman says. The corrugated steel of the container that houses the master suite becomes a textured wall for writing messages in the home's entrance. "When we were furnishing the house, I thought, 'Oh no! Our fridge isn't magnetic for Eli's artwork,' but then I realized the whole house is magnetic," Feldmann says. "We've become magnet connoisseurs," Freeman adds. The outdoor shower can be accessed through the master bathroom or from the back porch, which is nice after a long bike ride on a hot Houston day--especially since the couple stores several of their nine bikes inside the walled-off shower space. Freeman and Feldmann's two dogs, Arnold and Ruti (short for Rutabaga), have claimed their territory as the space between the ground and the bottom of the 20-foot-long container that houses the kitchen. "The dogs like to go under there, because it's a two-foot-high space that is shaded and gets a nice breeze," Feldmann says. "When we were landscaping, we had to make sure to leave a path for the puppies so they could get to that spot." The horizontal steel I beam that wraps around the house above the containers was salvaged from a warehouse. The home's roof rests on beams that span from the 40-foot-long container on the north side of the house (right) to the one on the south. The kitchen is the prime spot from which to observe the rest of the house. The view extends through the dining room and living room, past the glass doors and windows, across the patio, into the guest quarters, and out its back wall of glass to the fence that lines the back of the couple's property and lights up at night. "You feel like the captain of the house in the kitchen," Freeman says. Entering the house by the front door (right), the first view one gets before turning left and entering the main living area--where the couple's dog Ruti likes to lounge--is of the color-shifting fiberglass light wall. "Whenever possible, I like to open up views, not reveal everything at once, which is why I made a subtle entryway to the house," Robertson says. "It's nice to not walk right into a room but instead let things unfold as you move through the home." The couple had a big flat-screen TV but didn't want it to be the focus of the living room. Placed on the wall behind one of the red couches, it hangs quietly without drawing attention to itself but is in perfect position for TV-watching from the second couch (not pictured). Below the television is a console that Feldmann's mother picked up at a thrift store for $50. Feldmann had her reservations about the piece at first but after they took off its original base and lifted it on two-by-fours for an elevated look, she was sold. Downtown Houston, Texas, feels like a ghost town. Buildings with tinted windows loom heavily and cast dark shadows on the abandoned sidewalks. Residents rarely spend time here, and when they do, you would hardly know it: 6.3 miles of tunnels connect more than 80 city buildings, pushing pedestrians underground and away from the heat, the humidity, and the possibility of a dynamic urban lifestyle. Though the city lacks visible signs of human interaction, Houston is industrially and economically one of the busiest places in America. Its refineries produce up to 1.5 million barrels of oil each day, and its port handles the most foreign cargo—and second-most total tonnage—in the United States. Each year, more than 225 million tons of cargo pass through the 25-mile-long port, including 1.6 million shipping containers—or 1.6 million potential building blocks, in the eyes of Houston developers Katie Nichols and John Walker. Nichols and Walker met in 2004 at Burning Man, a weeklong art bacchanalia in the Nevada desert, and forged a friendship over like-minded design dreams: “We both wanted to create affordable, design-intensive housing for creative, urban people,”Nichols says. In 2006, they founded Numen Development to do just that with affordable, easily acquired, incredibly durable shipping containers. Though containers are part of Houston’s vernacular, Nichols and Walker knew the idea of living in one was not. Thus, their first order of business was to build a prototype home. In a transitional neighborhood two miles north of downtown Houston, they found a pair of available lots, empty save an abandoned speedboat rusting on the lawn. The properties were across the street from a meat distributor, which could have meant an uphill battle for winning over potential residents, but the location also provided access to Houston Heights, a hip part of town where neighbors chat over espresso at coffee shops and hang out with their kids in nearby parks. Despite its unconventional elements, Robertson was able to create a traditional rectangular plan. Outside, the corrugated steel of three containers—two 40-foot-long modules and one 20-foot-long unit—form the northern, southern, and western facades, with a glass wall to the east completing the perimeter of the 1,538-square-foot home. Inside, the containers act as “really wide walls” into which Robertson inserted the private and utility areas. The master suite fills the southern container; the second bedroom and bathroom, plus an opening for the office and playroom, take up the northern one; and the kitchen and laundry rooms inhabit the 20-foot unit parallel to the street. In the middle, the dining room flows into the living, office, and play spaces then out the glass doors to the 400-square-foot deck that connects the home to a 40-foot-long container that houses the guest quarters and storage shed. With the plans completed and the building permit in hand, Nichols and Walker were ready to lay the foundation of the home and cement their status as a container construction company when, two weeks before they were scheduled to break ground, their investor pulled out. Desperate, Nichols emailed everyone she knew looking for a new financial backer. She received a reply asking for details not only about investing but also about moving in. The bailout message came from the “F-man(n)s”—Kevin Freeman and Jen Feldmann, whom Nichols befriended in 2003. Freeman and Feldmann had met at Indiana University, when he was studying to become a dentist; she, a doctor. The dental and medical schools shared an anatomy lab, and Freeman and Feldmann shared a tendency for running late—which left them working at adjacent tables. “We fell in love over cadavers,” Freeman jokes. The couple moved to Houston in 1997 for Feldmann’s residency, and, like so many of the city’s residents, their intended temporary status soon became permanent. “Houston’s not full of obvious natural beauty,” Freeman says, “but it has a lot of hidden charms,” like the close-knit art and music communities. When Nichols’s email arrived in Feldmann’s inbox, the couple and their then-one-year-old son, Eli, were living in a neighborhood too far away from friends and venues to meet up for a last-minute dinner or catch a show. “Where we were living, there was nothing to do that was within walking or biking distance,” Freeman says. “You couldn’t even bike to breakfast!” Feldmann exclaims. Nichols’s plea for help led the couple to the solution they were looking for. Freeman and Feldmann took out a construction loan in the fall of 2007 and were moved in by April 2008. Although they traded a house with seven closets and a two-car garage for one with just two closets and no garage, they were happy to finance their friends’ dream and have access to a vibrant neighborhood. Now Freeman and Feldmann walk to the doughnut and snow-cone shops down the street and rave about the breakfast-burrito joint around the corner. They ride their bikes, which total nine (including a tandem), to meet friends and take Eli and their two dogs, Arnold and Ruti, to play at the numerous parks that dot the area. The meat distributor begins loading trucks as early as 5:30 a.m., but the couple imagines themselves as hipsters living in New York City’s meatpacking district, and that makes it okay. Though people sometimes stop to look at the house, the clever use of containers often goes unnoticed. Feldmann, however, loves pushing aside the landscaping to reveal the integrity of the structures. She also takes full advantage of their metallic qualities: “When we were furnishing the house, I thought, ‘Oh, no! Our fridge isn’t magnetic for Eli’s artwork,’ but then I realized the whole house is magnetic,” Feldmann says. “We’ve become magnet connoisseurs,” Freeman adds. Perhaps the greatest reminders of the home’s origins are the messages written throughout the house in magnetic letters. The couple has thought about one day adding on a container for when Eli gets older or they have another child. But what they really have their hearts set on is acquiring the land across the street—which the meat distributor has hinted at putting on the market—and building condominiums and an attached restaurant, all made from containers. Even if neither of those dreams comes to fruition, there will be more containers on the block: Nichols and Walker are both building their own homes on the lot adjacent to Freeman and Feldmann’s. Nichols’s is a single raised 45-foot container, and Walker’s is an integrated three-container design much like the couple’s. The future of container construction, however, is still unclear. These architectural building blocks are readily available and relatively inexpensive: Containers can be purchased for anywhere from $2,000 for a weathered model to $5,500 for a lightly used one. But in Houston, as elsewhere, the biggest challenge lies in the building codes, which help maintain the status quo by resisting radical change. As more designers push container architecture from fad to legitimate building system, it’s possible that one day they will be seen not only as units for shipping but also as containers for living.